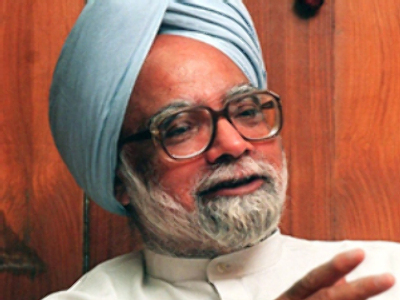 Indian Prime Minister Manmohan Singh said the attacks in Mumbai were probably plotted by a group based in a neighbouring country. The dastardly terror attacks that took place in Mumbai last night and today leading to the loss of many precious lives and injuries to many others have deeply shocked the nation. I strongly condemn these acts of senseless violence against innocent people, including guests from foreign countries. I offer my deepest condolences to the bereaved families and sympathies to those injured. The government will take all necessary measures to look after the wellbeing of the affected families, including the medical treatment of the injured. The well-planned and well-orchestrated attacks, probably with links to outside forces, were intended to create a sense of panic. They chose high profile targets and indiscriminately killed foreigners. I salute the courage and patriotism of the police officers, including the Chief of the Anti-Terror Squad, Shri Hemant Karkare and the men who have laid down their lives in fighting these terrorists. I assure the country that we will reform the police so that the law and order authorities can work in a united way, effectively and in a determined manner to tackle such threats to national integrity. We are not prepared to countenance a situation in which the safety and security of our citizens can be violated with impunity by terrorists. It is evident that the group which carried out these attacks, based outside the country, had come with a single-minded determination to create havoc in the commercial capital of the country. We will take the strongest possible measures to ensure that there is no repetition of such terrorist acts. We are determined to take whatever measures are necessary to ensure the safety and security of our citizens. Instruments like the National Security Act will be employed to deal with situations of this kind. Existing laws will be tightened to ensure that there are no loopholes available to terrorists to escape the clutches of the law. Most importantly, it is essential to immediately set up a Federal Investigation Agency to go into terrorist crimes of this kind and ensure that the guilty are brought to book. We will take up strongly with our neighbours that the use of their territory for launching attacks on us will not be tolerated, and that there will be a cost if suitable measures are not taken by them. We will take a number of measures to strengthen the hands of our police and intelligence authorities. We will curb the flow of funds to suspect organisations. We will restrict the entry of suspects into the country. We will go after these individuals and organisations and make sure that every perpetrator, organiser and supporter of terror, whatever his affiliation or religion may be, pays a heavy price for these cowardly and horrific acts against our people. In this hour of tragedy, I appeal to the people to maintain peace and harmony so that the enemies of our country do not succeed in their nefarious designs. All concerned authorities are on alert and will deal sternly with any attempts to disturb public order. I am confident that the people of India will rise together to face this grave challenge to the nation's security and integrity.